EMMS, in collaboration with CH Technologies, now offers a new solution for dry powder or fibre aerosol generation, the Vilnius Aerosol Generator features a proprietary physical agitator unit, with easy sample loading and high-efficiency generation. Compatible with both micronized and non-micronized agents, the unit utilizes closed-loop feedback control when combined with TPM 100 Total Particulate Matter transducer. The system is ideal for low volume/low flow generation requiring precise regulation. The Vilnius Aerosol Generator (VAG) is a general-purpose dry powder disperser. The VAG is a highly reliable device, which produces aerosol concentrations from 1 to 2000 mg/m3. In addition to its capability of producing high aerosol concentrations, VAG provides exceptional deagglomeration characteristics. The instrument consists of Controller and Disperser units. The Disperser contains a dynamic aerosolization and a deagglomeration assembly. The aerosolization assembly includes a dust chamber for placement of a powder to be aerosolized. Airflow, directed into the chamber through a control valve and jets impinges upon the powder dispersing it into the air. 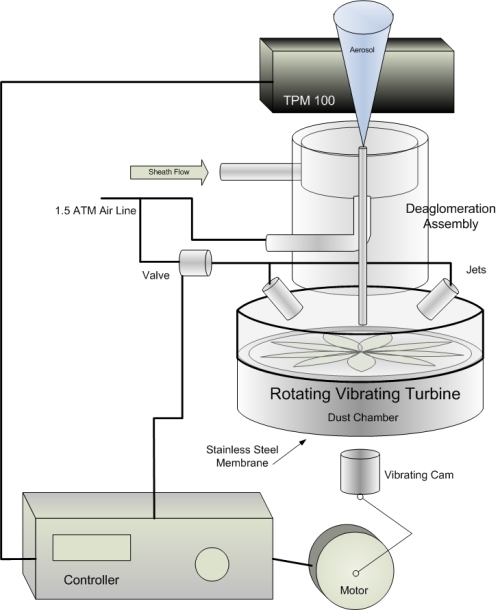 Simultaneously air jets activate a turbine which is used for continuous supply of powder under the air jets. The aerosolization efficiency is increased by means of vibrating cam which oscillates the turbine. low velocity aerosol stream exiting the capillary.